What Is Five Spice Powder and How Is It Used? Five-spice powder brings its complex mix of flavors to Chinese cuisine, with one notable use being in the red cooking technique. You will find it sold year-round as a powdered mix. It is the best-known Chinese spice mixture and it combines spices in accordance with the balancing philosophy of yin and yang. Five-spice powder is a seasoning blend of ground spices, appearing as a dry brown powder. In Chinese cuisine, it is most often used to flavor braised or roasted meat, fish, and poultry dishes, and may be included in marinades and rubs. The typical blend is fat-free, gluten-free, dairy-free, vegan, and vegetarian. Chinese five-spice powder may have originally been used medicinally to balance yin and yang. Five is considered to be a number associated with healing properties. It has been integrated into Chinese and Taiwanese cuisine and it is also used in Vietnamese cuisine and in other parts of Asia. For cooking, the theory that five-spice encompasses a balance of the main flavors, with interesting interplays between cool (yin) and warm (yang). A typical recipe for five-spice powder calls for Szechuan (Sichuan) peppercorns, ground cloves, fennel, cinnamon, and star anise. Five-spice powder can also include anise seeds, ginger root, nutmeg, turmeric, cardamom, amomum villosum pods (similar to cardamom in the ginger family), licorice, orange peel, or galangal. 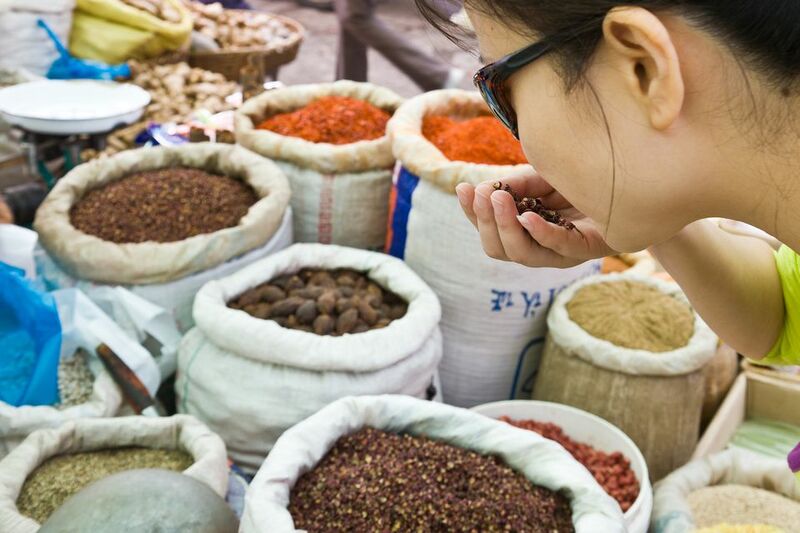 In southern China, five-spice powder usually uses Saigon cinnamon and orange peel to replace Chinese cinnamon and cloves, so the five-spice powder from southern China tastes a little bit different compared to other five-spice powder from other regions of China. Five-spice powder has a distinct licorice-like flavor due to star anise, with sweet and warm flavors from the cinnamon and fennel. Cloves add a cooling sensation while the Szechuan peppercorns add a numbing and peppery note. Cinnamon is sweet, but unlike sugar, it has a spicy undertone. Some five-spice recipes call for Chinese cinnamon or cassia, a close cousin of true cinnamon, but with a more pungent flavor. Szechuan peppercorns are not a pepper at all, but a reddish brown berry that comes from the prickly ash bush, Szechuan peppercorn has a truly unique taste. The first sensation from this aromatic spice is a peppery (spicy) taste that quickly numbs the tongue. Soon, you'll pick up hints of anise and ginger, gradually becoming lemony (sour), salty, and hot. Ground cloves have a pungent, sweet flavor. Star anise has a taste similar to licorice with a more bitter undertone. Fennel is similar to anise but sweeter and less pungent without as much of the licorice taste. Five-spice powder is used sparingly as a spice or a meat rub, as it can be quite strong. This fragrant mixture is delicious in any stir-fry recipe. Also, try mixing a teaspoon with some oil and vinegar and use it to baste steak or pork while it's on the grill. Occasionally you will also see five-spice powder added to a sauce. Five-spice powder goes very nicely with tofu and it's one of the secret ingredients in pressed seasoned bean curd. A traditional dish called five flower pork consists of pork belly that is marinated in five-spice powder and other seasonings and steamed. Western versions of the dish substitute pork tenderloin or pork chops and call for stir-frying instead of steaming. Five-spice powder adds a spicy kick to dry rubs or marinades for meat, fish, or poultry. It goes particularly well with pork or you can rub it onto chicken before you roast it. It will also add a Chinese twist to vegetables and even to a fruit salad. Bottled five-spice powder can often be found in the spice section of most supermarkets. But a better source can be an Asian market, where it is likely to cost less and be more authentic. At Asian markets, it may be packaged in a plastic bag, allowing you to check the aroma and compare brands before you buy them. Be sure to store it in an airtight jar when you bring it home. Store five-spice powder in a sealed glass container in a cool, dark, dry location. As with most powdered spices, it will lose its potency over time. It is best to buy it in small amounts and replace it every couple of months for the best quality, although it will still be safe to use for several months. Five-spice powder is a way to add complex Asian flavors to your dish without adding salt, sugar, or significant calories. This is especially true because a little goes a long way with this potent spice blend. The blend provides a minor amount of fiber, iron, and calcium. In traditional Chinese medicine, the five flavors present in five-spice powder ensure proper organ function and boost health overall. Cinnamon is a hot yang spice, while fennel, clove, star anise, and Sichuan peppercorn are warm yang spices. The flavors are believed to promote circulation and stimulate appetite. Where Can You Buy Szechuan Peppercorn?